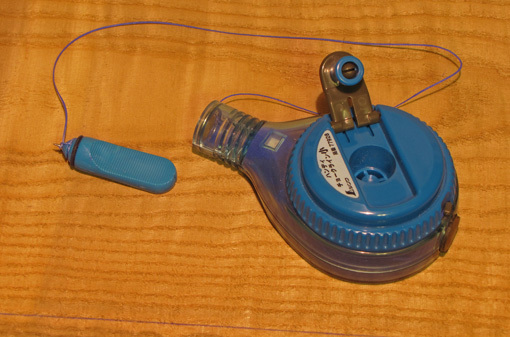 The chalk line, a tool usually found on a job site, can also be very useful in the woodshop. When breaking down stock, it is good practice to not automatically accept the long edges as they come from the mill. Ripping a new edge may improve the figure pattern or location, and maximize the yield of quality pieces from a board. 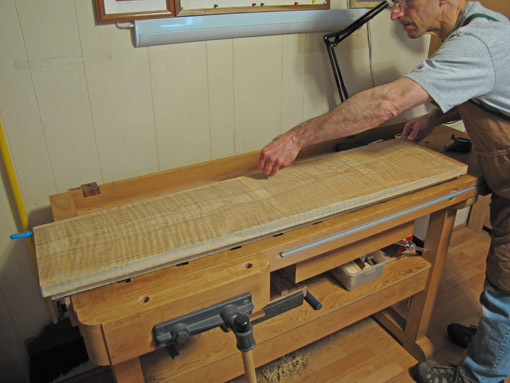 A few examples: you can eliminate some “runout” of the annual ring pattern off the edge of a board that will be part of a glued-up table top by relocating the long edge to be closer to parallel with the figure lines and to match the mating board’s edge. A waney edge may be removed to produce a maximum of clear wood and prepare the board for the jointer. A new edge can adjust figure patterns in the wood to coordinate with how the wood will later be shaped. Snapping a chalk line quickly and easily marks a new edge to be ripped. The chalk line produces a much more visible line than does a pencil on rough-surfaced wood as it comes from the mill. It is far easier to handle and has more capacity than a long straightedge. Blue chalk shows up well on light or dark woods. Though most any chalk line from a hardware store would probably be adequate, I prefer a Shinwa brand tool which uses a thin string and very fine chalk to produce a distinct, fine line. (Tajima also makes what appear to be similar chalk lines.) I insert the push pin at the end of the line into the desired spot on the end grain and then draw out line to the opposite end of the board, adjust the location of the line, hold down the line, reach out, lift the string straight up, and let it snap to produce the line. 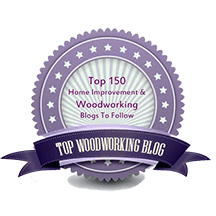 I usually use the bandsaw to rip rough lumber, never the table saw where uneven surfaces and unpredictable wood create safety hazards. Sometimes a hand saw or jig saw are more practical for this cut. Strategically managing the wood in the early breakdown stages is one of the most important factors to producing quality woodwork. The simple chalk line can help. This just refers to figure lines that meet the edge of a board at an angle rather than parallel to it. It would be common in boards that have obvious annual rings, such as oak, with a strong cathedral (flatsawn) figure. This makes it harder to match the edge to a mating edge when trying to make an inconspicuous edge glue joint. The term, I think, is common, though I don’t know if it’s universal. Anyway, that’s the idea. I been enjoying this blog series. I bought a 6 foot aluminum ruler a long time ago. While it isn’t Starrett quality it is handy for checking long boards for straightness – both face and edge. I don’t recall it being very expensive. I consider it a useful companion to the chalk line. If you want the ruler to be really straight you can lay down a chalk line and compare the edge of the ruler to it. Any obvious deviation can be corrected with a file or sanding block – easy to do with soft aluminum.